Sharon Cantillon/Buffalo News The Lodge provides a whole roast pig suckling dinner for a minimum party of 10. Chef Todd Lesaskowski presents the roast pig to the table before taking it back to the kitchen to slice up. To view a photo gallery, visit buffalonews.com. As the dining experiences available to Western New Yorkers continue to grow, there’s only one sit-down restaurant whose definition of dinner includes the option of sharing a pig with your friends. 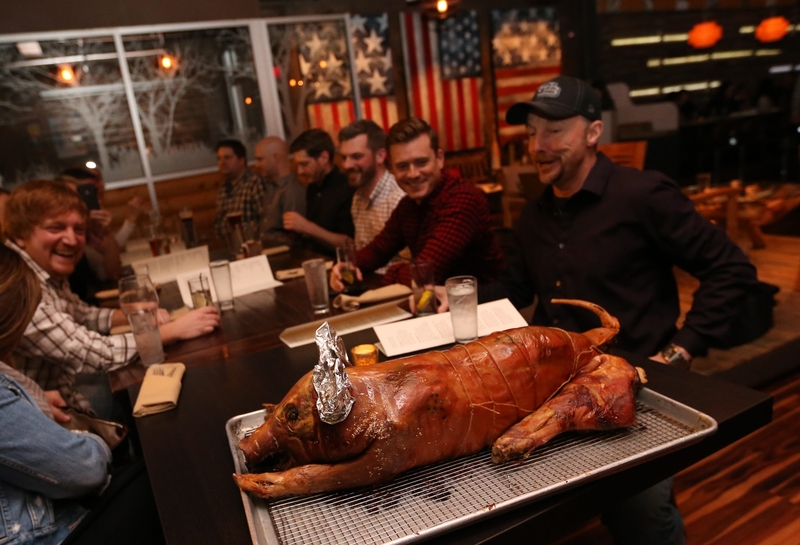 In December, the Lodge began offering a suckling pig dinner, designed for 10 people or more. The centerpiece is a young pig roasted whole. After appetizers, the pig is presented to the party, then served with a series of side dishes. The meal is a communal experience, a group activity with a “Game of Thrones” worthy centerpiece capable of feeding a horde. Chef Todd Lesakowski said Buffalo was unusual among communities he’s worked in, in that groups of 10 people or more would show up for dinner. “I wanted to offer some sort of fun food for groups, something worth getting together and making arrangements for, something different than you would normally do,” he said. The pig feast starts with raw seafood, usually shrimp, crab, oysters and clams, served with mignonette and cocktail sauces. The pig is a milk-fed juvenile roasted whole until its meat is tender and skin is crisp. Lesakowski stuffs the animal with housemade Toulouse sausage, and roasts the 25-pound animal for about seven hours. The pork is served with apple butter, whole-grain mustard, and red pepper mostarda, a sweet-and-sour Spanish sauce. The guest of honor, at the head of the table, gets the head of the pig. Cheeks and kidneys round out the platter, and are presented in a sauce of sherry, Dijon mustard and cream. There are usually seven side dishes (or more). They change, but in early spring have included pork belly macaroni and cheese, potato pancakes, broccoli and cauliflower gratin, caramelized sweet potatoes, roasted butternut squash and beets, roasted Brussels sprouts with bacon, and housemade biscuits. Dessert is iced sugar cookies in the likeness of pigs. The restaurant needs 10 days advance notice to prepare the meal. The cost is $450 before tax and tip for 10 people, $45 for each additional person. Info: The Lodge, 79 W. Chippewa St. (256-1940, thelodgebuffalo.com).